Google Street View Trusted Photography lets customers see inside. 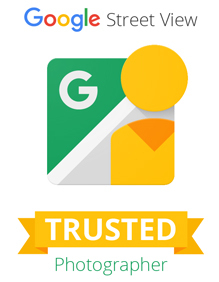 Our photographer Nicola is now a Google Street View Trusted Photographer for Manchester, Stockport, Cheshire & surrounding areas. Nicola has been approved by Google to do their business photography that is integrated into business owners Google pages. If you’ve ever looked at Google’s street view and Google places the tours are incorporated into these pages to enhance your web content. Nicola can shoot virtual tours and photography for business owners and upload it to Google places to have a look around their premises. All this will be uploaded to Google page to enhance your business listing and gain more customers. You can embed them on your web site and you can also have high resolution copies of the photographs. Street View | Trusted let customers see inside!